Tovi Image Viewer for Mac OS X! 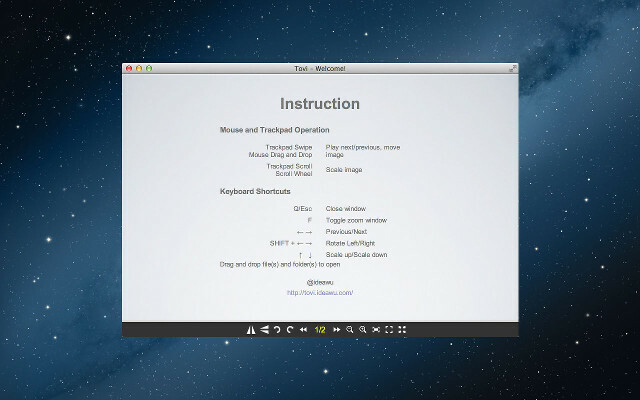 Tovi is the image viewer for Mac OS X, to replace Preview for viewing images. Tovi automatically discover other images to generate slideshows when you open image from Finder. GIF animation playing is supported, also, GIFs are scalable, rotatable and flipable. Simple keyboard shortcuts: ← → ↑ ↓, for zoom, rotate, etc. When you open one image from Finder, Tovi will auto discover images in the same folder, then you can navigate through these image by arrow keys. NOTICE: Because of Apple Sandbox restriction, users need to set permissions in Preferences. Copyright © 2013-2018 ideawu.com. All rights reserved.